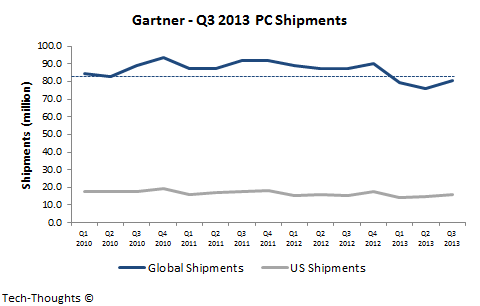 Gartner's PC shipment estimates show that the industry continued to decline YoY to 80.3 million units. While these are still weak numbers, they are up sequentially and are much higher than my previous estimates. Let's take a look at how this may affect the tablet-PC substitution rate and the prospect of tablets overtaking PCs in Q4. 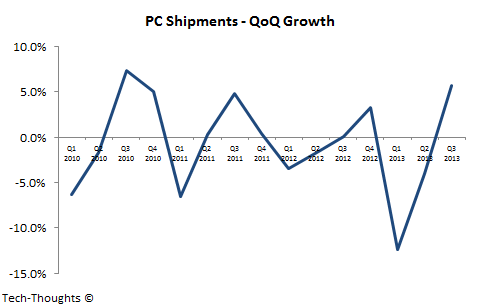 The numbers show that PC shipments have shown sequential growth, but are still below the lowest post-2009 level. This growth could have been caused by two factors - (1) Windows XP upgrades by enterprise buyers (as IDC suggests) or (2) increased channel fill because of Windows 8.1 devices (as Gartner suggests). However, this most likely breaks the symmetry between the tablet-PC and smartphone substitution rates, at least for Q3 shipments. The chart above shows that strong shipment growth in Q3 is almost always followed by a "no growth" quarter. This could be because of "back to school" purchases or channel fill for the holiday season. This implies that Q4 PC shipments should stay between 78-82 million units - however, enterprise XP upgrades are harder to predict. In any case, this does seem like a challenging target for tablet shipments. After the refresh, iPad shipments could come in anywhere between 22-30 million. Therefore, the pace of tablet-PC substitution will be entirely dependent on holiday sales of Android tablets.